Trigeminal Neuralgia (TN), or "Tic Douloureux" is characterized by intermittent, shooting pain in the face. TN is diagnosed by clinical symptoms, but all patients should have an MRI scan of the head to evaluate for any intracranial abnormality. The most common cause of Trigeminal Neuralgia is an enlarged looping artery or vein pressing on the Trigeminal nerve at the base of the brain. Other less frequent causes are multiple sclerosis or a brain tumor, both of which can usually be identified by MRI scan when they exist. Tumors require immediate surgical attention, whereas face pain caused by multiple sclerosis can be treated the same as Trigeminal Neuralgia except that microvascular decompression is not feasible. Face pain which is secondary to a dental procedure, or which is classified as "atypical facial pain," is different from Trigeminal Neuralgia and the following comments may not be applicable. The initial treatment for Trigeminal Neuralgia should be medical. The most effective drugs are carbamazepine (Tegretol®) and gabapentin (Neurontin®). They should be started at a low dose and gradually increased with the ideal dosage being that which controls the pain but does not cause side effects. If during therapy the pain subsides completely for four weeks, it is reasonable to gradually reduce the dosage and see if the Trigeminal Neuralgia has gone into remission. If the pain recurs the drug can be re-instituted. For those patients whose symptoms cannot be controlled medically without side effects such as nausea, ataxia, or mental dulling, or who desire long term relief without medication, it is wise to consider surgical options. The surgical options can be divided into two categories: non-destructive procedures and destructive procedures. The conventional MRI scans used to rule out the presence of a brain tumor or multiple sclerosis as a cause of a patients face pain are not adequate to visualize the trigeminal nerve or an associated blood vessel. Fortunately, the continued improvement in MRI neuro-imaging now makes it possible to visualize both. The technique, which is called 3-D volume acquisition, is performed with contrast injection and utilizes thin cuts (0.8mm), without gaps similar to what was developed for MRI angiography and venography. The trigeminal nerve is easily visualized in the axial plane when the MRI series is centered at the midpoint of the fourth ventricle. To ensure an adequate evaluation, the nerve should be seen on three adjacent cuts. Early studies indicate that when an offending vessel is present it will be detected 80% of the of the time. With continued imaging improvements this percentage will definitely increase. Click here for UCSD Trigeminal Neuralgia Sequence Parameters for Seimens and GE MR Scanners. The only non-destructive procedure which reliably relieves the symptoms of Trigeminal Neuralgia is Microvascular Decompression (MVD). This involves surgical exploration with the operating microscope and visualization of the junction where the Trigeminal nerve enters the base of the brain, followed by coagulation or moving and padding away any compressing blood vessels. The advantage is pain relief without numbness in the majority of patients, which usually lasts indefinitely. If the pain recurs after a MVD, which it does in 10-15% of patients, it can usually be controlled with low dose Tegretol® or Neurontin®. If the pain continues, it will require a repeat MVD or one of the destructive procedures. 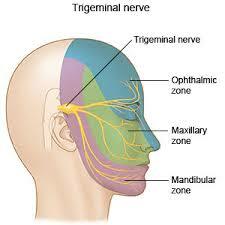 There are multiple destructive procedures which are beneficial in the treatment of Trigeminal Neuralgia. The most common of which are glycerol injections, gamma knife radiation, electrocoagulation, and balloon compression. These procedures are all based on interrupting the pain by partial damage to Trigeminal nerve fibers. Generally the more numbness they produce, the longer they last. The specific advantages and disadvantages need to be discussed with the surgeon performing the procedure. These procedures are recommended for patients who have failed MVD or are not candidates for major surgery. Treatment is always individualized. All of the options above should be considered in consultation with a neurosurgeon familiar in their use.